On the morning of January 4th, the 77% illuminated moon will set between 02:00 and 03:00, depending on your latitude. This coincides with the predicted time of maximum activity in the Eastern Time zone. The moon will be above the horizon for other time zones to the west. Still, the low altitude of the moon and the fact that it lies in the opposite portion of the sky will allow good views of any Quadrantid activity. If the moon is above your horizon be certain to view with it to your back to allow you to face the darkest sky possible. Don’t waste this opportunity to view this elusive shower. 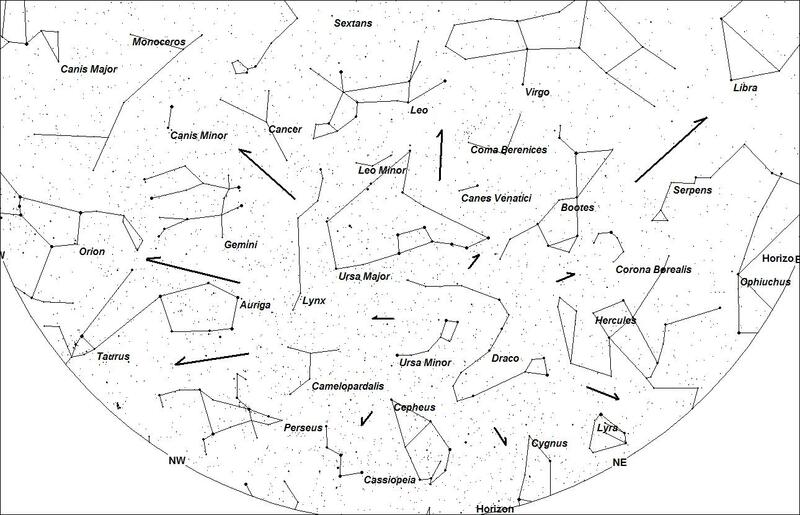 The Quadrantids of 2013 will peak with a last quarter moon in the sky. Maximum activity will also occur after daybreak for most of North American so should your skies be clear, do not waste this opportunity to view this shower. The Ursids are an obscure shower that is active for a week prior to Christmas. This shower is listed among the annual major showers as its ZHR (Zenith Hourly Rate) averages ten shower members per hour. Actual rates can be quite variable. I have seen years when it has reached 25 per hour and others when the shower is nearly non-existent. 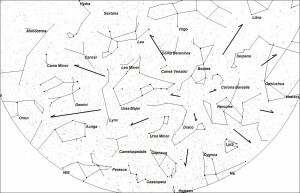 2011 is a favorable year to try and view them as the waning crescent moon will not interfere much with observations. The Ursids are particles shed from comet 8P/Tuttle. The Earth passes through the debris field of comet 8P Tuttle from December 18 through the 24th. We are situated closest to the center of the comet’s orbit on December 23rd; therefore the Ursids will be most active on this date. Particles from comet 8P/Tuttle strike the Earth at a perpendicular angle far above (north) the ecliptic. 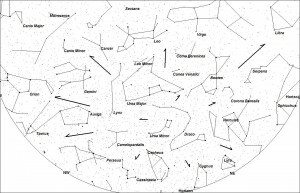 As seen from the Earth’s surface these meteors will appear to shoot forth from an area of the sky (the radiant) located near the bowl of the “Little Dipper”, also known as the constellation of Ursa Minor. The bright orange star Kochab (Beta Ursae Minoris) is a good guide to the Ursid radiant. Kochab is a circumpolar (never sets) star for all locations north of latitude 15 north. Therefore from this portion of the Earth, the radiant is in the sky all night long and Ursid activity may be seen at any time of night. For northern tropical areas the radiant is located low in the north during the evening hours. During the morning hours the radiant slowly rises and reaches the same altitude of nearby Polaris (Alpha Ursae Minoris) near 0300 local standard time. The best time to view Ursid activity from anywhere is during the last hour before dawn when the radiant lies highest above the horizon in a dark sky. Due to the high northern declination (celestial latitude), this shower is not visible to observers located south of the equator. Since the Ursids strike the Earth at a perpendicular angle they will appear to travel slower than the better known Perseids of August or Leonids of November. Entering the atmosphere at 33 kilometers per second, this shower has velocities comparable to the recent Geminid shower. Most of the Ursid meteors are faint therefore it is important to observe from rural areas away from city lights. Since the radiant lies in the northern half of the sky it would be best to face this general direction to see the most activity. There is no need to stare directly at the radiant, rather it is advised simply to place the radiant somewhere within your field of view so that it will to easy to trace which meteors line up with Kochab (Ursids) and those that don’t (non-Ursids or sporadics). There are two other areas of minor activity active during the Ursids. The antihelion radiant lies in central Gemini and will produce 2-3 slow meteors per hour. While facing north these meteors would enter your field of view from the upper right during the evening hours, from above and behind you near midnight, and from the upper left during the morning hours. The December Leonis Minorid radiant will produce swift meteors from eastern Leo Minor that are only seen from the northeast during the morning hours. If viewing from dark skies one should also be able to count 10-15 sporadic (random) meteors per hour. If you would like to contribute more to our knowledge of the Ursids, then I invite you to get serious about meteor observing and to make an hourly count of the activity you witness. Other more detailed projects include the estimating the magnitude, velocity, and color of each meteor. Others also note whether there was a persistent train after the meteor has vanished. Meteor watching can be both fun and scientifically useful endeavor. To be scientifically useful you must share your data with an active meteor organization such as the AMS. We accept data from observers with all levels of experience.